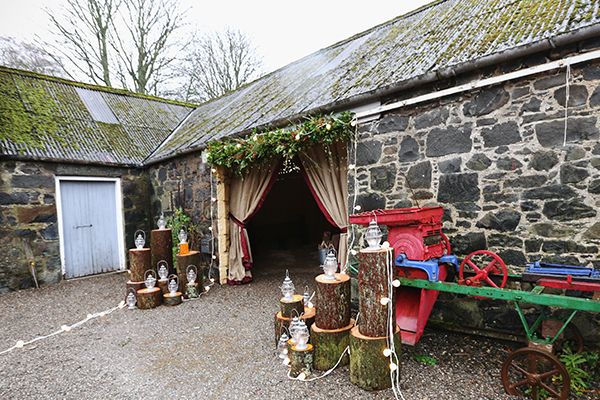 Set in the heart of rural Perthshire, Comrie Croft isn’t your typical wedding venue. Nestling in over 200 acres of hill and woodlands this hidden gem is normally an award-winning green holiday destination for camping, hostelling and mountain biking. A truly DIY wedding venue you are given the freedom to do things your own way and create a day to remember. The rustic Barn (capacity 200) and Cow Shed are complete blank canvases just calling out to be decorated in your own unique way. With two nights’ accommodation in their simple farmstead (sleeping 74) included, the Croft is ideally suited for a laid back house party or festival type atmosphere where you want to spend a bit more time with your guests. Whether you want to say your ‘I dos’ in a secluded woodland clearing, hurtling down a dual mountain bike trail or in the cosy barn, there’s definitely something for everyone. If you’re looking for something a little different why not spend your wedding night in a Norwegian Kata or try a Pre Nup Wake Up mountain bike ride with Comrie Croft Bikes? No matter what you choose to do, a wedding at Comrie Croft is guaranteed to be memorable.